Over the course of the next few blog posts, we’ll be examining some of the best ways to expand your home and make use of your available basement space. 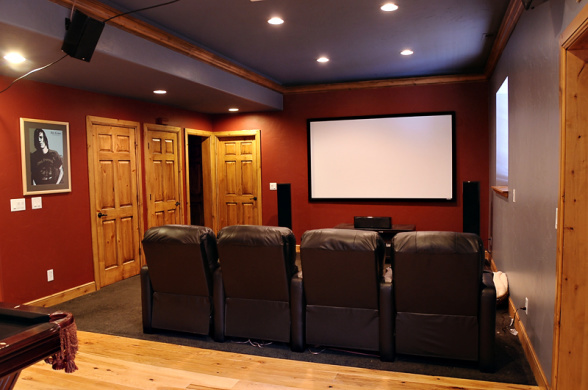 In our first post: Finishing your basement to be a fully-featured media room, home theater or family room. Whether grabbing popcorn for the big movie, or hot dogs for the big game, one popular venue is a basement media room. 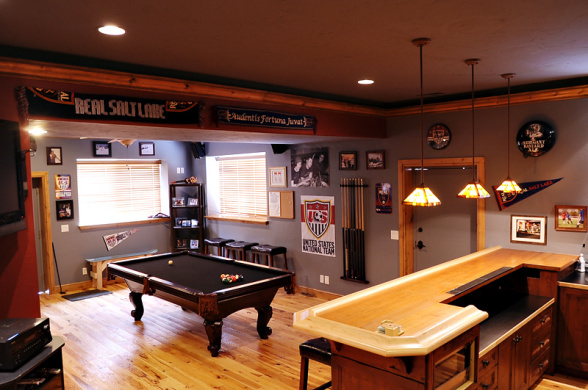 It’s an increasingly popular use for finished basement space. In many ways, a basement is the perfect space for installing a big-screen TV – one of the few places in the home that you can make completely dark, and naturally insulated to keep expensive electrical equipment protected against extreme temperatures. The Home Theater: With the advent of Blu-Ray and movies-on-demand, the home theater is becoming an increasingly popular alternative to hitting the multiplex (and the popcorn’s a lot cheaper!) One cool thing about using a finished basement as a home theater is the option of really blowing-out your cinema sound experience – you have completely freedom to install a surround sound system limited only by your imagination. The Family Room: If you enjoy both movies and sports, making your media room more family-centric is a great option. A finished basement gives lots of extra room for sofas and seating, and added options like a fridge, wet-bar and other entertaining equipment. This makes the space incredibly versatile; perfect for relaxing with the family to watch a movie together, or as a large open space for getting together with friends. One thing to remember: However your finishing your basement, you need to remember to add a means of egress if one doesn’t exist already. A means of egress, like a basement window well, allows people to easily escape your basement in the event of an emergency like a fire. A means of egress is part of national building code – but more importantly than that, could save lives. In addition, adding a basement window will make your home media room even more enjoyable; because it adds a natural source of light (which you can cover up when the movie starts) and fresh air and ventilation. Great post – thanks for sharing. Many people over the years have adopted the approach for the conventional games room or theatre room as a converted basements. However, recently basements are getting a new look as a kitchen. What are your thoughts on a basement kitchen? Really a nice concept and ideas….!!! The home theater image is very nice and want to make my basement as per that..! !